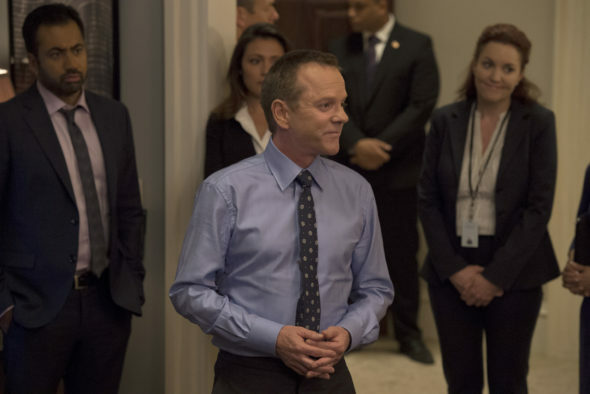 How well does President Kirkman preserve, protect and defend the Constitution of the United States in the second season of the Designated Survivor TV show on ABC? As we all know, the Nielsen ratings typically play a big role in determining whether a TV show like Designated Survivor is cancelled or renewed for season three. Unfortunately, most of us do not live in Nielsen households. Because many viewers feel frustration when their viewing habits and opinions aren’t considered, we’d like to offer you the chance to rate all the Designated Survivor season two episodes here. An ABC political drama, Designated Survivor stars Kiefer Sutherland, Natascha McElhone, Adan Canto, LaMonica Garrett, Kal Penn, Maggie Q, Malik Yoba, Paulo Costanzo, Zoe McLellan, Ben Lawson, Tanner Buchanan, and Mckenna Grace. The conspiracy thriller series centers on Tom Kirkman (Sutherland). After an attack on Capitol Hill wipes out the line of succession, this HUD Secretary becomes President of the United States. In Designated Survivor, season two, President Kirkman is on the hunt for the terrorists who destroyed the Capitol, even as he handles the daily Oval Office crises. What do you think? Which season two episodes of the Designated Survivor TV series do you rate as wonderful, terrible, or somewhere between? Should ABC cancel or renew Designated Survivor for a third season? Don’t forget to vote, and share your thoughts, below. 9/5/18 update: Designated Survivor was cancelled by ABC but Netflix later picked it up for season three. My wife loved this show and couldn’t wait to watch we truly loved the show and how it kept you on the edge of your seat wit all the twist and tune in the storyline. Please bring it back! One of the best shows ever! more like this in your channel. Awesome. Please renew!!! Another good show, a keeper! I cannot believe that Designated Survivor was cancelled, it was one of the best shows out there! I looked forward to watching it every week and it always kept me on the edge of my seat! At least I still have TWD! Please, please reconsider!!! You are 100% right. Designated Survivor was great. I kept up on all of them rather than record for weeks or months. That’s for sure. I love Designated Survivor. Great acting, too.